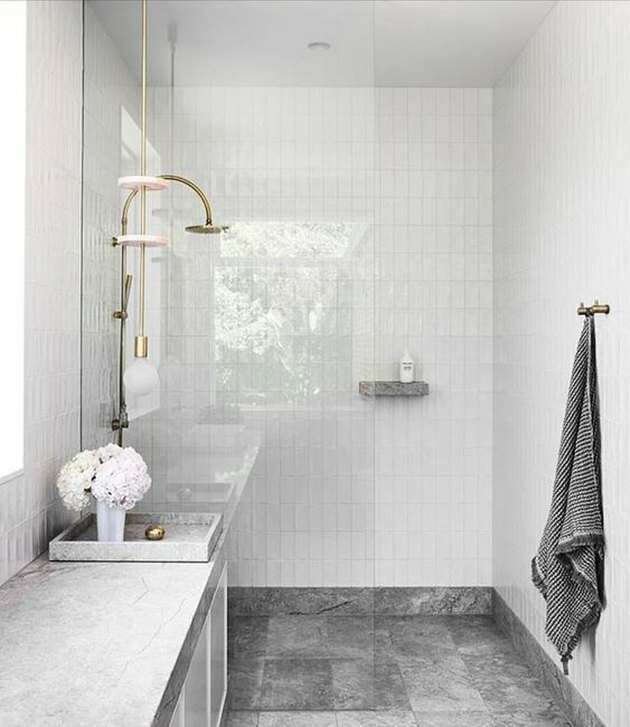 Neutrals have been coming back in a big way over the last year, so it's no wonder we've found ourselves pining over the stone bathroom designs popping up in our Pinterest feeds lately. From marble to granite, these naturally occurring materials are ideal for adding organic texture to your home. And depending on your choice of stone, they each offer different pros and cons so make sure you read up on them before you commit to anything. Now if you're ready to get the decision-making process started, we've got you covered with all of the inspiration you need. Scroll on for 10 elegant stone tile bathroom designs that promise to stop you in your tracks. 1. Make it a feature. In collaboration with Belgian designer Lionel Jadot, West London-based architecture firm De Rosee Sa refurbished this Georgian townhouse. The master bathroom showcases warm fossil stone, in a honed finish, which balances the gray freestanding tub beautifully. 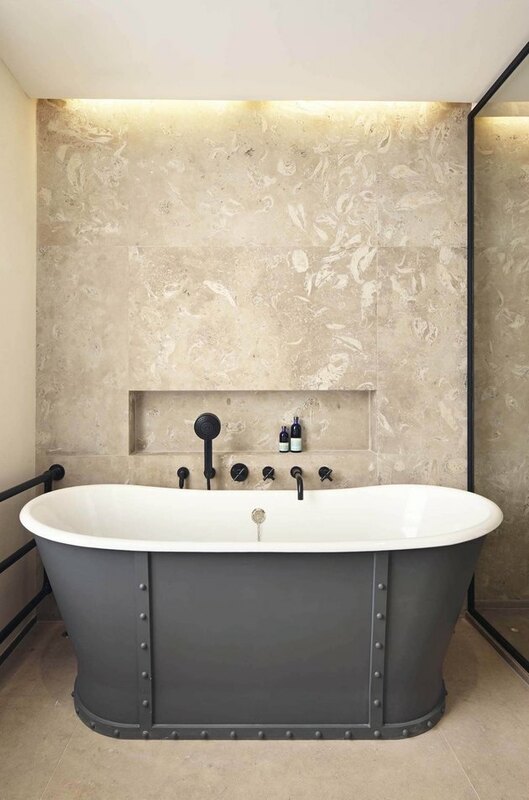 A mix of stone, wood, Carrara marble, and skylights makeup the design of this bathroom by Pipkorn Kilpatrick. The relatively small space has been transformed thanks to large scale square tiles and the introduction of natural light. 3. Add a touch of terrazzo. Terrazzo might be an engineered stone as opposed to a natural one, but when the results are this sophisticated, we had to include it in our roundup. 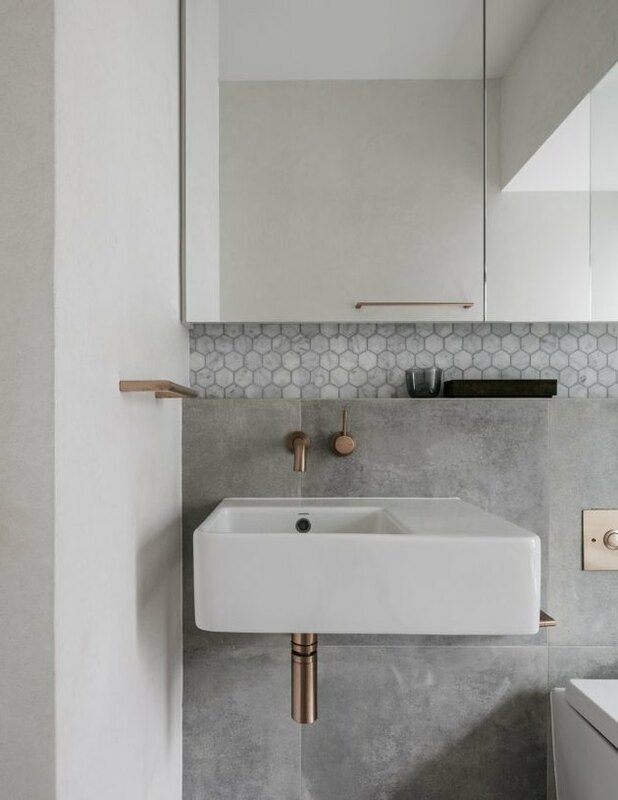 Designed by Melbourne design firm Flack Studio, this monochrome bathroom features terrazzo tile that blends in seamlessly. 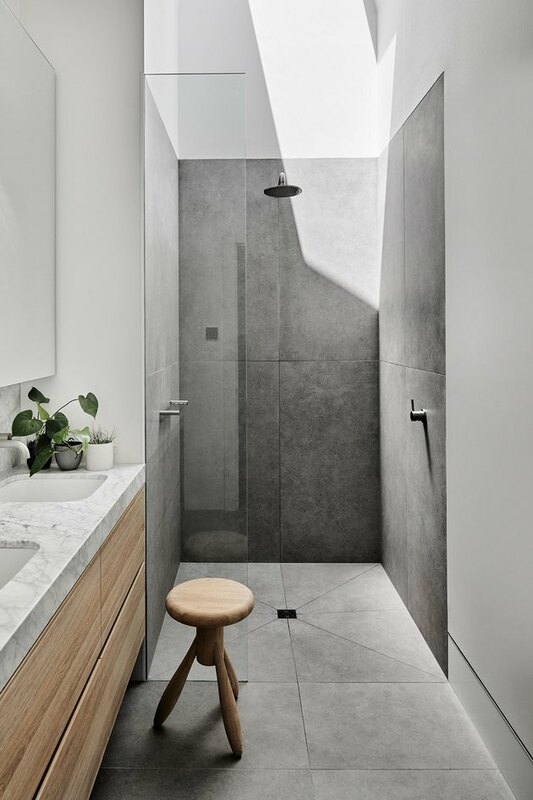 This stone tile bathroom design by MWAI architects makes use of geometry and pattern in a small space to add character and visual interest. 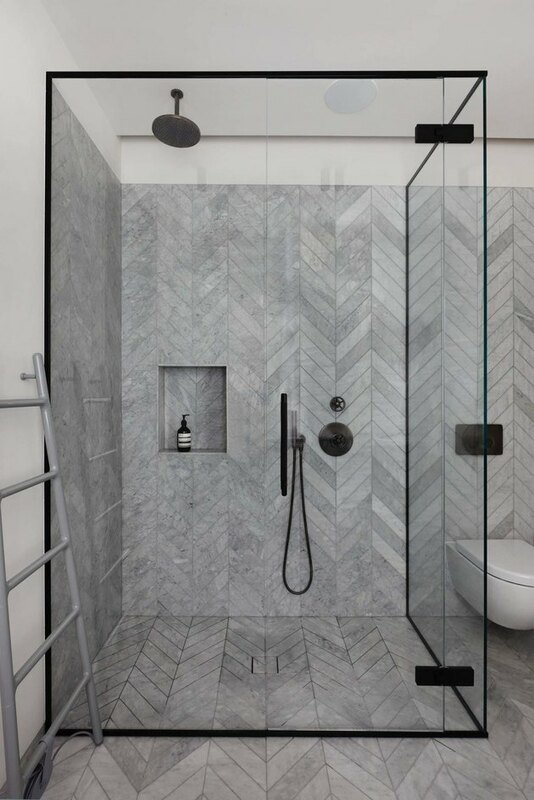 Marble stone offers a classic and elegant look on this bathroom's walls and floor, while the herringbone pattern makes it oh-so-current. 5. Opt for an all-neutral look. Natural limestone nails timeless elegance with its creamy hues, adding warmth and a soft tactile nature wherever it is used. This stone tile bathroom design by the team over at H & G Designs is neutral and chic paired with white cabinets and accented with brass and leather details. This bathroom by GIA Renovations features white marble metro tile and large gray stone tile with streaks of white and light gray. 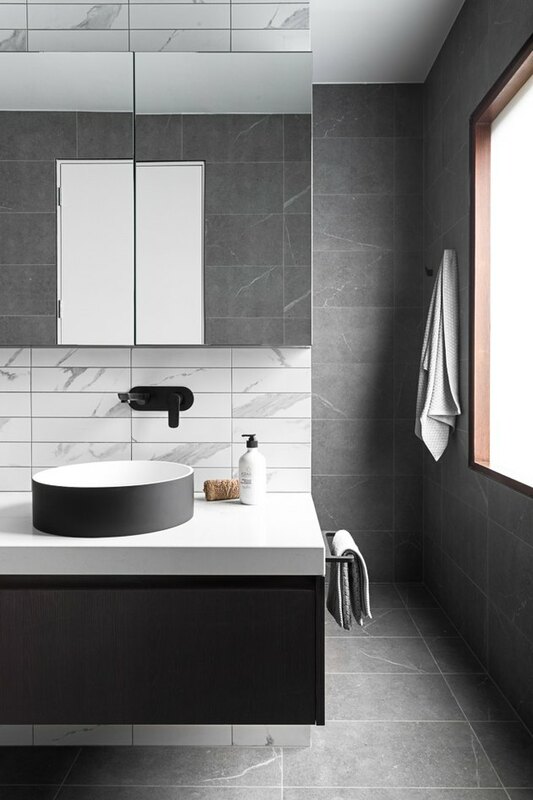 The black vanity, sink, and wall-mounted faucet completes the contemporary monochrome look. 7. Add complementary brass details. If we haven't convinced you to combine shapes and textures when using stone tile by now, we're not sure that we ever will. Multidisciplinary design practice Alexander & Co. explored a material palette of various natural hues and textures for this semi-detached cottage in Sydney, and the results are minimal yet magical. 8. Break it up with white. 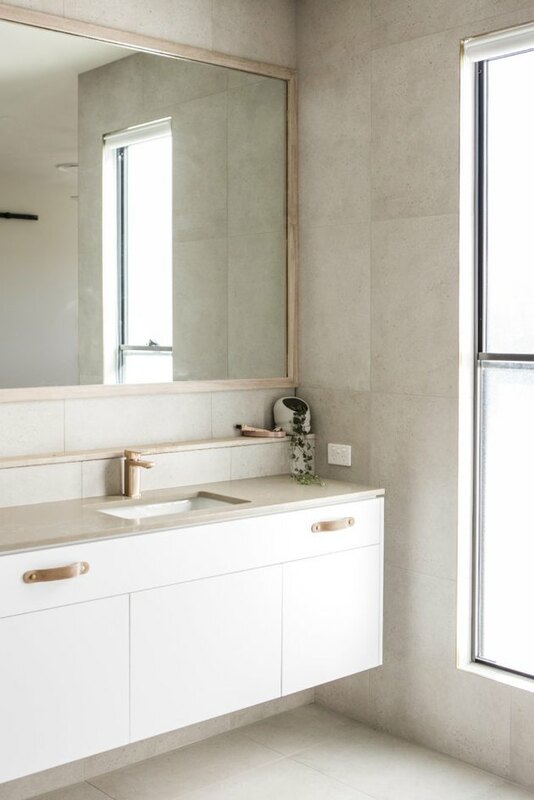 Interior architect and designer Lucy Bock used natural limestone on the floor and vanity countertop in a bathroom located in this Melbourne-based private residence. The use of plain white wall tile is the perfect match for a dreamy gray palette, while shadowy undertones leave the room feeling fresh, feminine, and elegant. 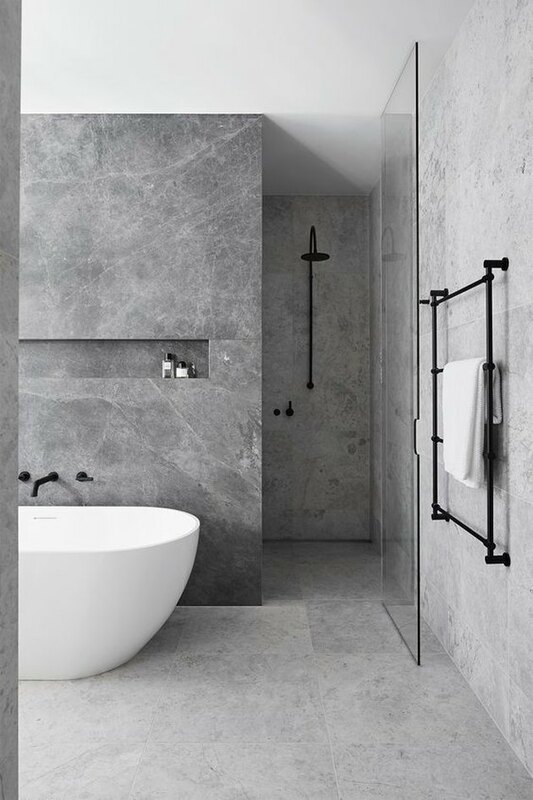 We're loving the intricacies of this stone tile bathroom design by The Design Duo. Detailed tile adds visual complexity and offers more texture than plain white or gray metro options. 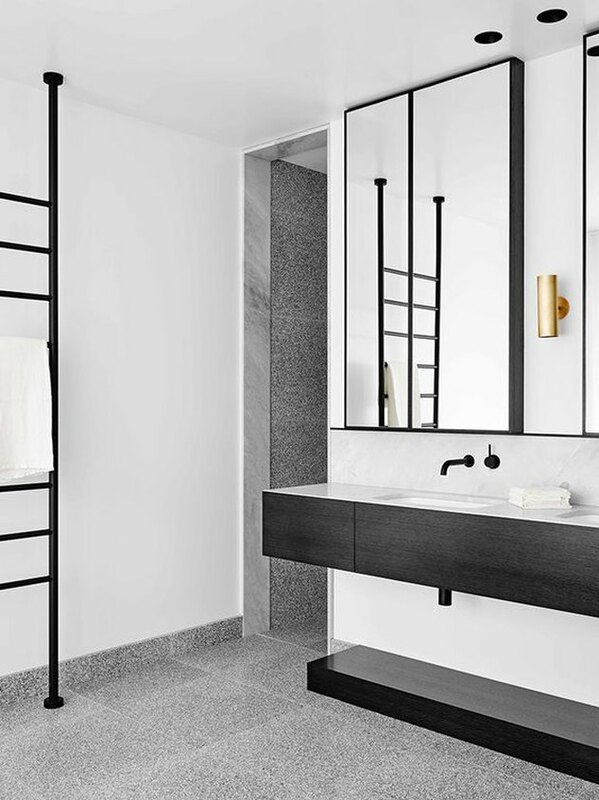 Complete the look with a bold black vanity cabinet and brass fixtures — luxury at its best. 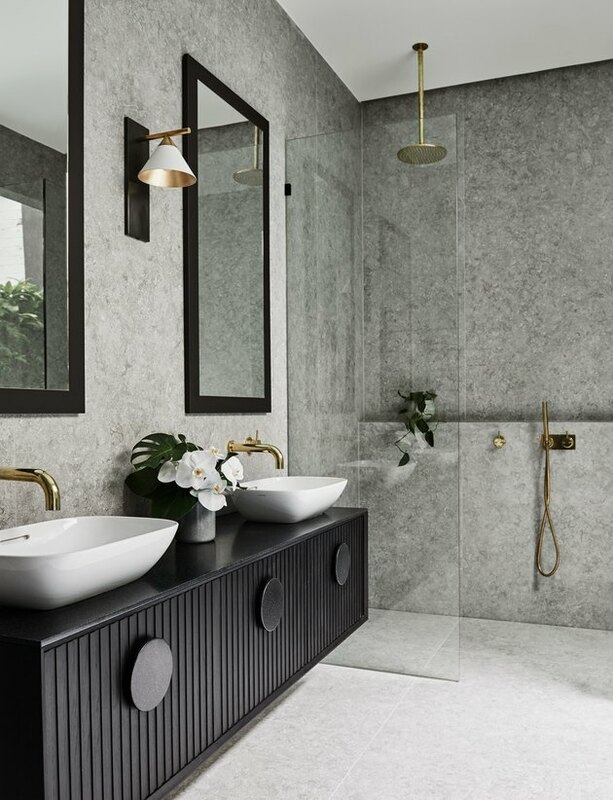 Decking out the entirety of your bathroom with stone will help bring about a relaxing, spa-like setting, as demonstrated in this home by Mim Design. 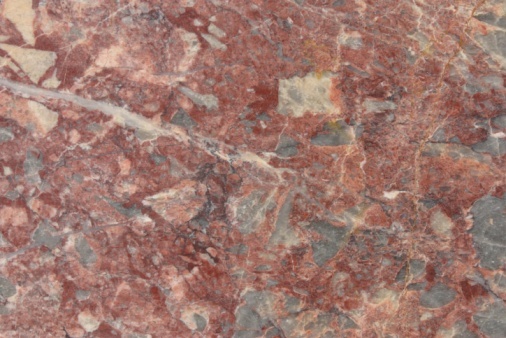 Plus, granite is an ideal choice thanks to its durable, nonporous, and antimicrobial nature. Just be sure to keep the rest of your bathroom simple, when covering vast areas, to help maintain a calm atmosphere.